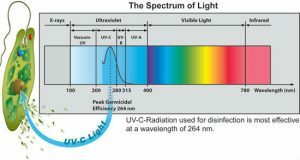 Ultraviolet light (UV), unlike chemical approaches to water disinfection, provides rapid, effective inactivation of microorganisms through a physical process. When bacteria, viruses and protozoa (cryptosporidium, giardia) are exposed to the germicidal wavelengths of UV light, they are rendered incapable of reproducing and infection. It is important to shield the UV light bulb from sediment in the water (typically with a sediment filter ahead of the UV system) to enable the most effective use of the system. An Ultraviolet Light (UV) bulb can be lit and appear to be good when it is not! A UV bulb loses intensity every day! They are rated to put out the proper intensity to inactivate bacteria for 12 months. After 12 months the bulb needs to be changed. Even if the light is on or still lit up it is not putting out the same intensity as it was when it was new. All UV bulbs need to be changed annually. They may not be effective past the 12 month interval. The key to UV disinfection is that different amounts of UV-C energy are needed to inactivate different bugs or organisms. The amount of energy needed is called the dose. And yes, it’s like a dose of medication in that you have to determine how much is needed to be effective. For UV systems, you get the dose by multiplying the light intensity by the exposure time. The exposure time is accounted for by the flow rate of the water through the UV chamber; while the light intensity is primarily accounted for by the design and quality of the lamp. Manufacturers of UV systems will typically design the system to provide a dose of 30 m J/cm2. This is sufficient to inactivate the microorganisms commonly found in water supplies (see table).That dose is typically guaranteed for about 9000 hours, or around one year of non-stop operation. After that, the lamp needs to be replaced. Why? Because the UVC intensity degrades over time, much the same way that the potency of a medication diminishes over time. Continuing to use your UV lamp beyond the prescribed 9000 hours is like taking medication after its expiry date. Just because it’s in your medicine chest doesn’t mean it will protect your health. Just because the UV lamp is still lit doesn’t mean it will protect you, either. Many UV systems are equipped with a countdown timer or other visual cue or even an audible alarm to alert you to the need to change the lamp. Your water treatment professional may even provide an annual service to keep you on track.